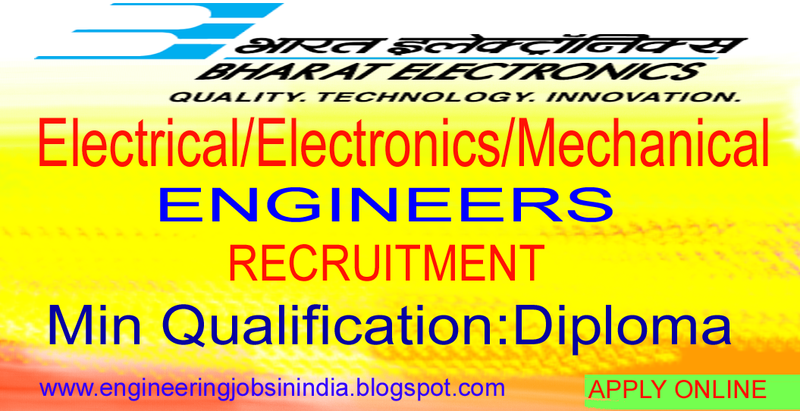 Diploma (Electronics / Mechanical / Electrical) The candidates should possess 3 years full time Diploma in Electronics Engineering / Electronics & Communication Engineering / Mechanical / Electrical / Electrical & Electronics discipline only. Correspondence course in Diploma shall not be considered as recognized qualification as per AICTE norms. Minimum percentage of marks is 60% marks (aggregate of all years) for General / OBC candidates and 50 % marks (aggregate of all years) for SC/ ST / PWD candidates. Upper age limit for PWD candidates shall be relaxable by 10 years (13 years for PWD candidates belonging to OBC and 15 years for PWD candidates belonging to SC/ST category). SELECTION METHODOLOGY: 5.1 The candidates meeting the criteria will be shortlisted for the selection process. The selection process will comprise of written test for 150 marks. 5.2 The eligible candidates will be required to appear for written tests (Objective type) consisting of: Part I: General Aptitude: 50 marks – comprises of general mental ability and aptitude to logical reasoning, analytical, comprehension ability, basic numeracy, data interpretation skills and general knowledge. Part II: Technical Aptitude: 100 marks – consists of Technical/Professional Knowledge Test with 100 questions having specific questions from respective discipline. and Part II put together) scored by the candidate in the written test. However, the candidature of the applicant will be provisional and is subject to verification of Certificates /Testimonials submitted by him/her. 6.5 The shortlist list of Executive posts for the interview will be prepared based on the cumulative marks (both Part I and Part II put together) scored by the candidate in the written test.